Located 10km north of Western Rocky Island, Fan Forest Pinnacle is a very colourful dive site in the Mergui archipelago. It is sometimes also refered to as Rocky Peaks. The limestone pinnacle’s shallowest point is 5m below the surface and it’s deepest doing beyond 40m. This can be an easy dive where divers descend to the deepest part of their profile and slowly circle the rock upwards. On occasions though, currents can be strong and it is not possible to get right around the pinnacle. Visibility ranges from 10m to over 30m. As the name suggests, this dive site is famous for the amount of seafans here. 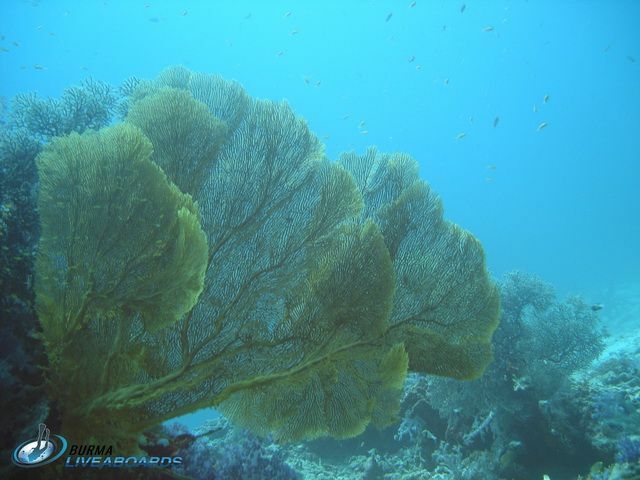 The biggest gorgonians are in deeper waters around 30m and below. They are very healthy and support a large variety of marine life including feather stars, cowries, hawkfish, ornate ghost pipefish and shrimps. They are surrounded by bearded scorpionfish and common lionfish. Schools of fish swim all around including snapper, trevally, butterfly fish, wrasse and soldierfish. Moray eels are also numerous. Oriental sweetlips and blue ringed angelfish are always present. On the deeper reef edges white tip reef sharks and grey reef sharks can be seen. On shallower parts of the reef look for octopus and cuttlefish around the hard and soft corals. In the blue water look for barracuda and the occasional visit from passing manta rays and eagle rays.